The relationship between sales and marketing departments is often complicated by their differing orientations. The sales side may see marketers as creative types who don’t have an eye on the bottom line, and marketers are sometimes tripped up by the sales team’s focus on living quarter-to-quarter. A classic sticking point for this relationship centers on the creation of marketing and sales material. The marketing team tries to create forward-looking content and collateral that address a broad range of prospects, but the sales team feels like that material doesn’t address the specific needs they are hearing from their most recent sales conversations. Being proactive in communications with sales produces better content that will not only be a key tool in closing the sale but can also be used more than once. 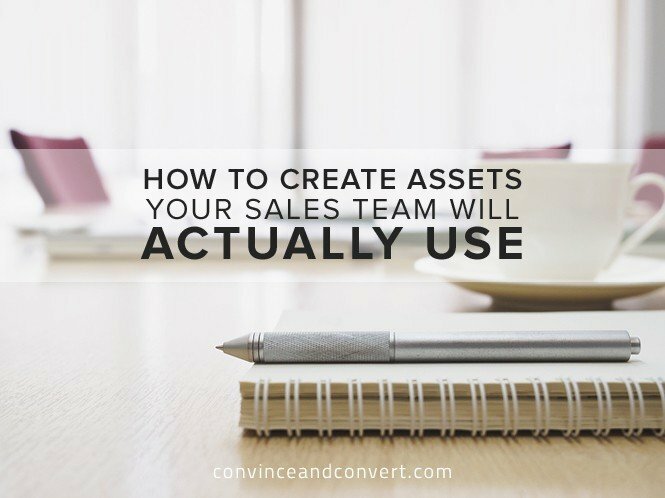 In order to get alignment about the assets that are really going to be used, here are a few questions to keep in mind. Who is this material for, and what problem do we solve for them? This should always be a marketer’s first question for everything they create. The part of the sales cycle that challenges marketers the most is that there may be a few different people to get through before you actually reach the decision maker. These gatekeepers perform different functions within a prospect’s organization and often put a very different filter on which aspects of your product or service are important to them. For example, executives may care more about cost and productivity than customer service people who most often care about client satisfaction. This is where it can get tricky with content—make sure you align your materials to what your specific target audience cares about throughout the entire buyer’s journey. Details matter. A successful close taps into the emotion of a specific pain point by using the words a prospect would most likely use themselves. Content fails when you create materials that speak to very broad audiences. It’s better to be specific about the problem you are solving for one group of people than to be nonspecific and, consequently, irrelevant to all. Where does this piece live in the customer lifecycle? This is especially important when you’re creating a new piece of content. Your approach will be different if it’s a top-of-funnel lead-capture item versus a facts-based case study that comes later in the decision-making process. It’s important to be strategic here and ensure you’re bringing as much analysis as you can to the table. A salesperson might come to you and say, “I need a pamphlet for a client in the healthcare industry,” when really the industry is less important than who the decision maker is and how their opinion will affect the overall sale. For example, if the prospect has to do a lot of internal convincing before closing the deal, you’ll want to give them content in a format that makes it easy for them to explain the benefits to someone on the outside. What does this type of prospect respond to best? This is all about knowing your buyer personas and making sure every piece of content you create aligns to them. Sometimes marketers feel tempted to create content that checks off a to-do list: You have your whitepapers, your ebooks, your infographics, and your case studies. But if you work in an industry that, say, doesn’t respond well to long form content, you’d be much better off creating material that they do respond to. You can’t shoehorn your prospects into responding to your content. You need to create content that fits your prospects like a glove. What kind of mileage will we be able to get out of this asset? That salesperson may truly believe this prospect is a special, amazing unicorn that deserves a huge investment and completely new material. And yes, there may be cases where the size of the deal warrants a complete redesign, but that’s rare. The goal of your team is to create content that can be applied to many, many sales conversations. You don’t know if that unicorn customer is actually going to sign, so these decisions must be strategic. A great way to prevent the one-off requests is to bring the sales team in as you’re creating content and make them an active participant. Interview them about what they hear in the field and the questions they get most often. Inquire about the content that closes sales as well as the content that was used in the most recent losses. By acclimating them in this process, you’ll provide context as to how and when they should be requesting new tools. By asking these four questions, you’re addressing two key concerns of the sales team: that the marketing team doesn’t listen to their needs, and that the marketing team wastes budget on material they can’t use. By tailoring content to your buyer personas, being strategic about the ROI of materials, and staying deliberate about how you address in each part of the decision-making process, marketing and sales teams can create materials that are more effective that either group could create on their own.